If you're just checking if a value is truthy or falsy, you can skip the comparison and just pass in the value. Since the value will have a boolean equivalent - it will evaluate to either true or false. // This is checking if value is "falsy"
@jsawbrey: I find the "is" naming convention also very helpful. I make them all the time. "isThisThing". In TypeScript, that naming convention helps a lot when making type guards. 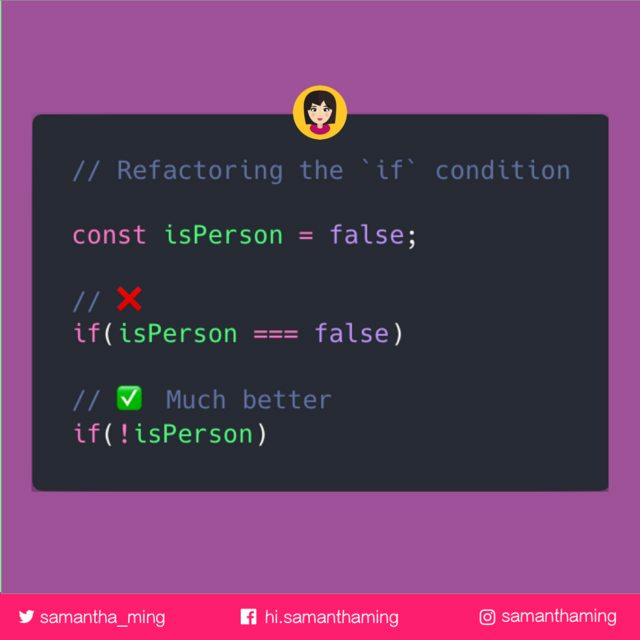 @jsawbrey: if a function sets a variable, "setThing" is good. If a function toggles a variable (on/off, true/false), "toggleThing" is good. On the note of good variable names. Here's another cool example. This is an excerpt from Adam's medium article, Use React to make a photo follow the mouse. @agm1984: Notice how we called the Class Methods handle rather than on. I like to remind people about the distinction between the two. on refers to the event on which we are doing something. handle refers to the action we are taking or the result of the event.